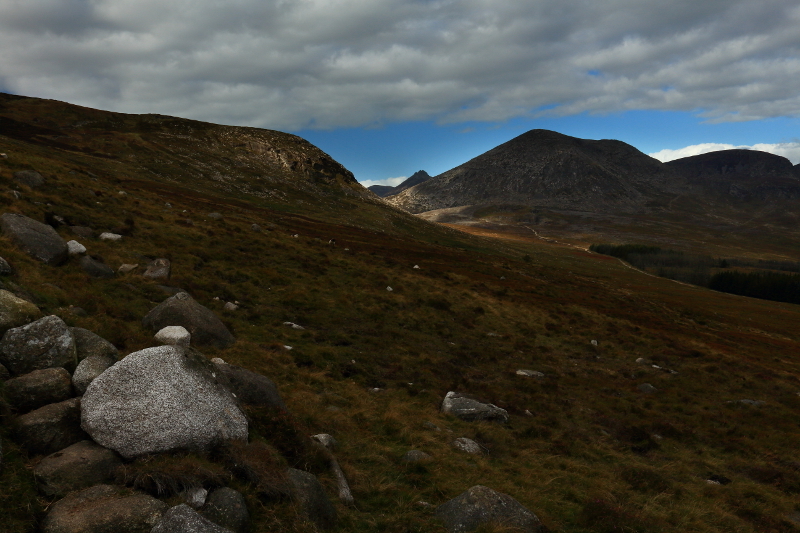 Approaching Slieve Binnian and its sister peaks from the southeast. Back at the end of May 2014 I had walked to the top of Slieve Binnian in the Mournes (https://aidymcglynn.wordpress.com/2014/06/06/in-the-clouds-on-slieve-binnian/), but it had been a little disappointing due to thick cloud covering the summit. Visibility was limited to mere feet ahead, making even appreciating things on the nearby scale such as the rocky tors on Binnian impossible. The stunning views possible from the summit were completely invisible. 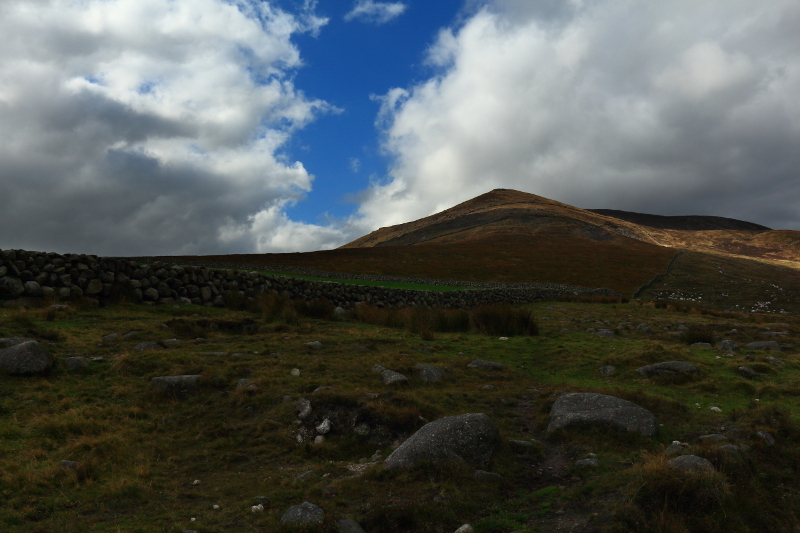 On that occasion I thought it wasn’t really worth continuing on my planned route to take in Slieve Binnian East Top, Slieve Binnian North Top and Slieve Binnian North Tor. I did promise myself I would return however in clearer conditions to appreciate this group of summits. At the start of October 2014 I got my chance and made a second attempt. 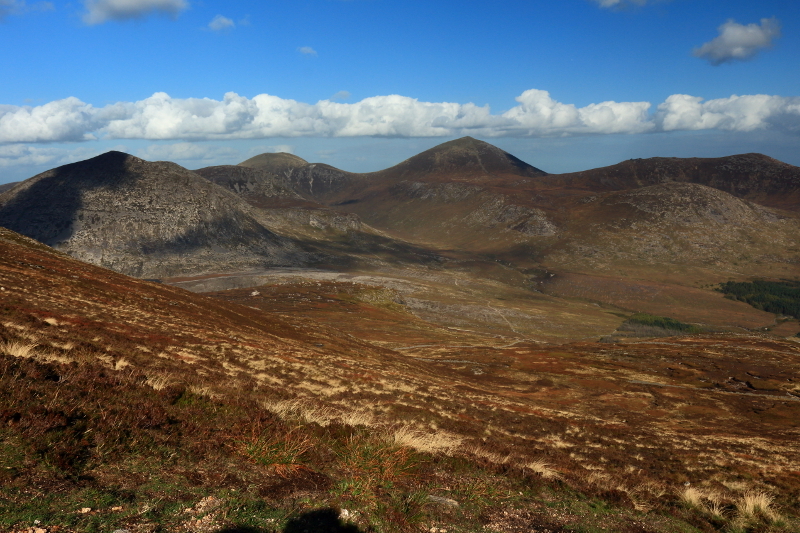 Approaching the mountains from the south east, on my way to the starting point at Carrick Little, the 745m high Slieve Binnian and its neighbours looked glorious in the sunshine. 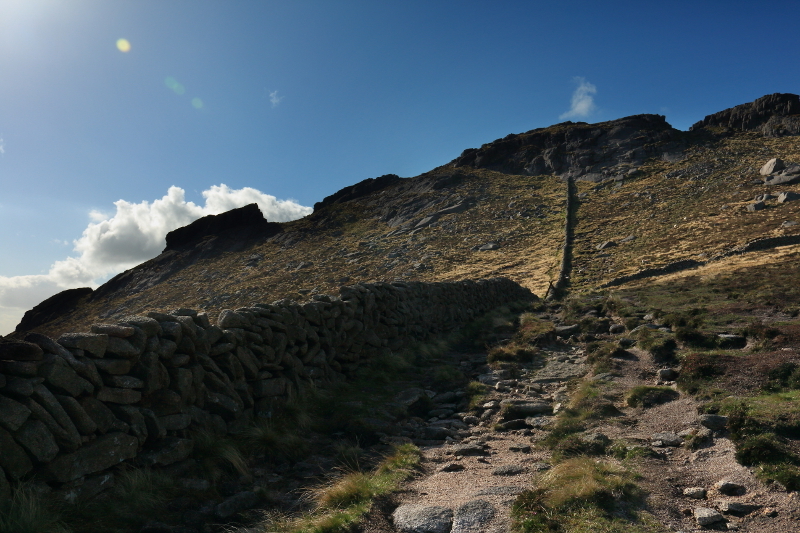 Reaching the car park at Carrick Little, there is a track alongside the famous Mourne Wall which can be followed in to the midst of the Mournes. Here, the weather was a little gloomier, but I could still see sunshine and breaks in the cloud in the distance so I remained optimistic. Looking over the stone wall alongside the track, there were already impressive views towards Slieve Lamagan, Slieve Comedagh and Slieve Donard. Standing in gloom, but sunshine in the distance. Slieve Binnian East Top, hiding Slieve Binnian itself. 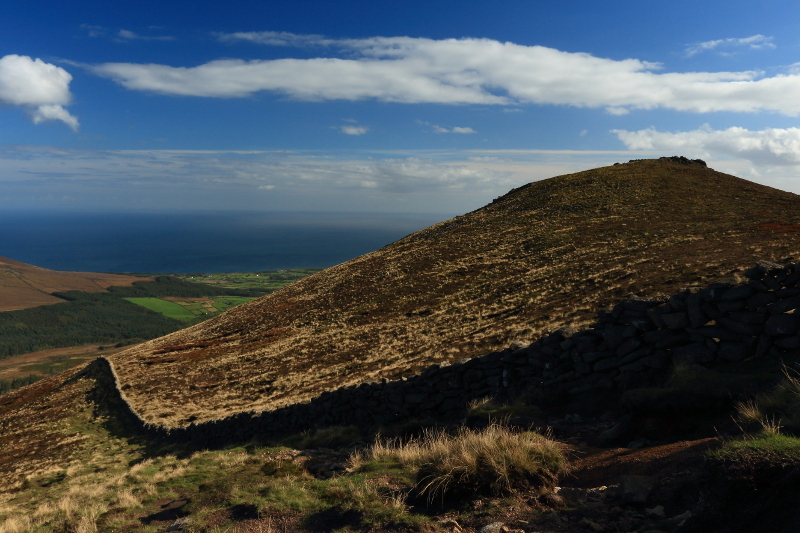 After approximately a kilometer or so on the track, I left it and branched off left on to the open hillside, where the Mourne Wall could be followed all the way to the top of Slieve Binnian. 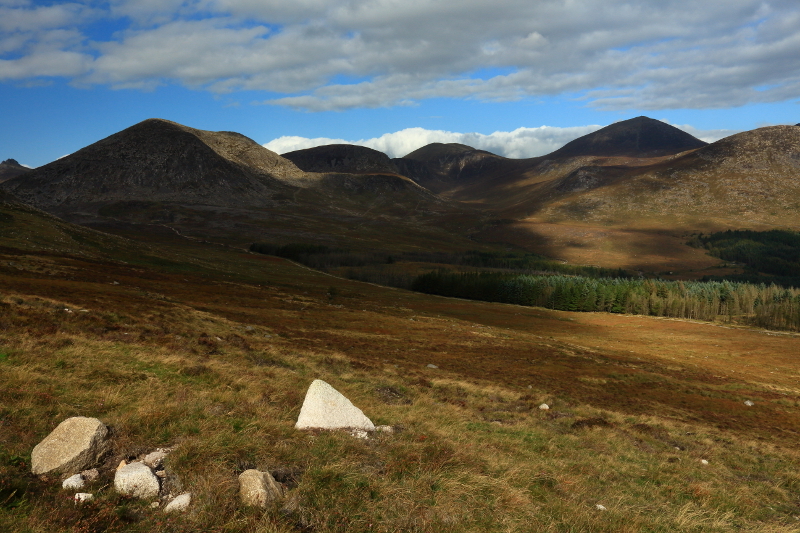 The track continued on the lower ground, heading deep into the heart of the Mournes and would be another great walk in itself. 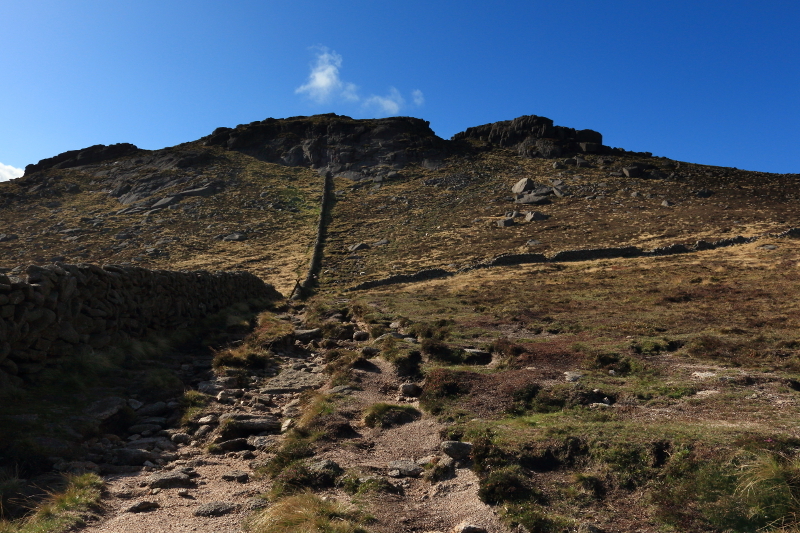 As I followed the wall upwards, Binnian East Top was on my left, and could have been visited on the way to Binnian, but this time I wanted to be sure to experience the huge rocky tors on Binnian in good weather, so decided to make straight for it, while the going was good. I would have to come back this way anyway, and could visit the East Top on the way back. 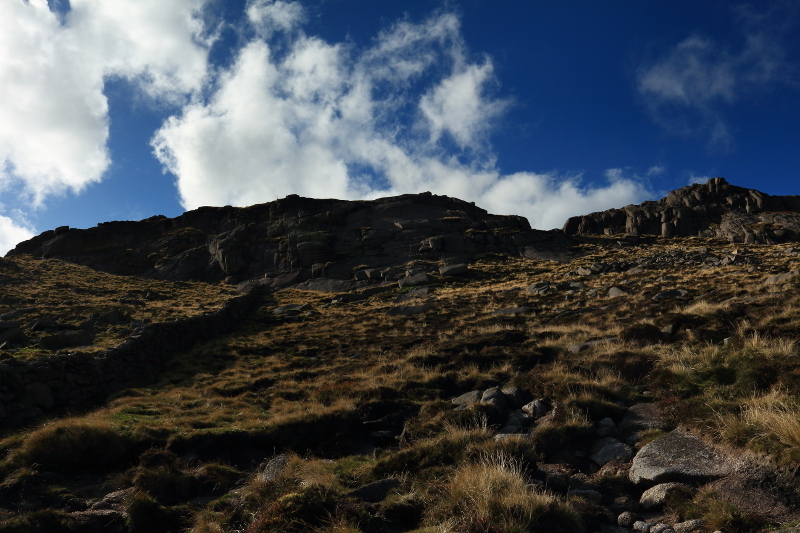 The weather continued to improve as I gained height, getting closer to the summit, although it was initially still hidden behind Binnian East Top. 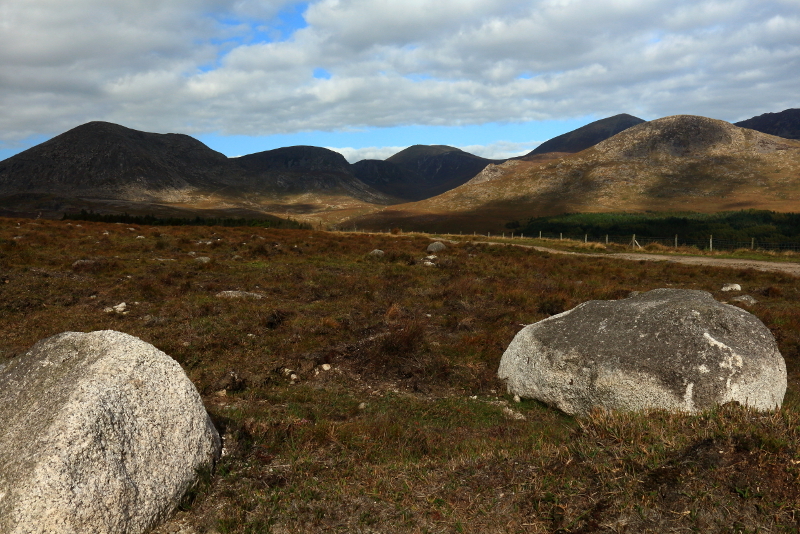 There were great views now however toward Slieve Donard and Slieve Lamagan. With height, the views also opened up behind me towards the east coast. 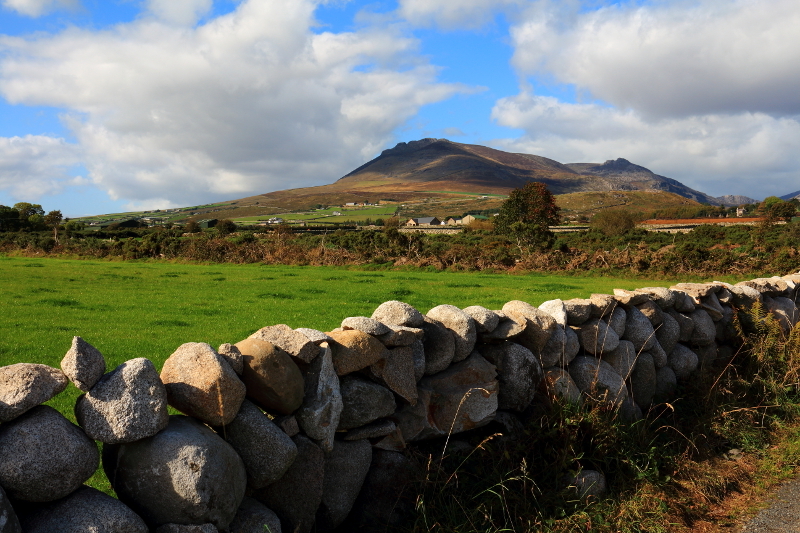 Slieve Binnian North Tor, a striking rocky summit, also began to appear around the curve of Binnian. 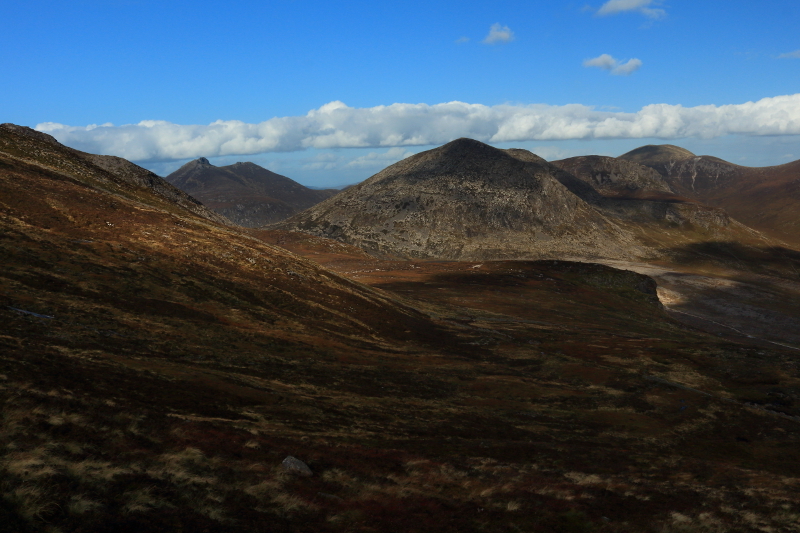 Looking along Binnian East Top’s slopes to the sea. 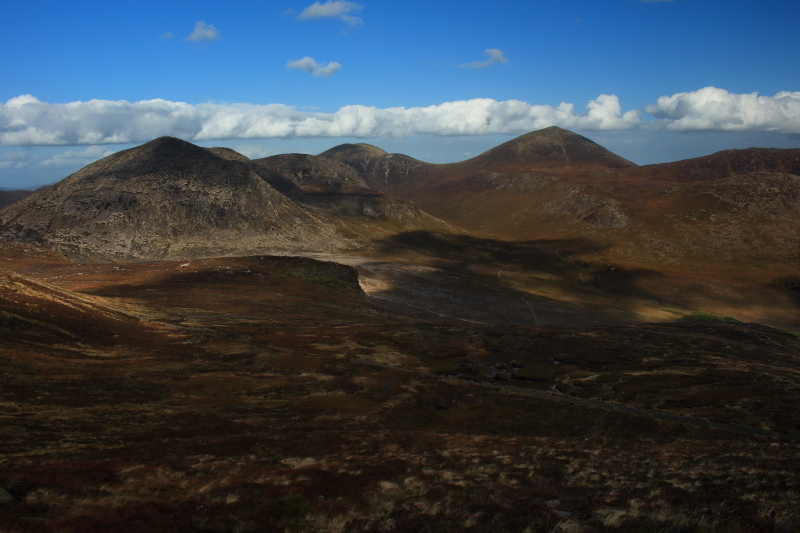 Slieve Binnian North Tor, making its appearance on the left of the frame, with Slieve Bearnagh in the distance in the centre. 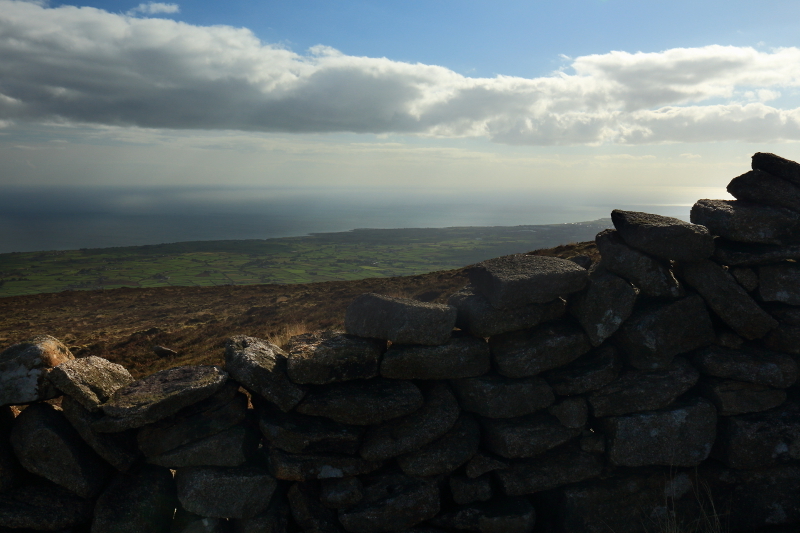 It was just a matter now of continuing to follow the Mourne Wall upwards, while admiring the truly breathtaking views. 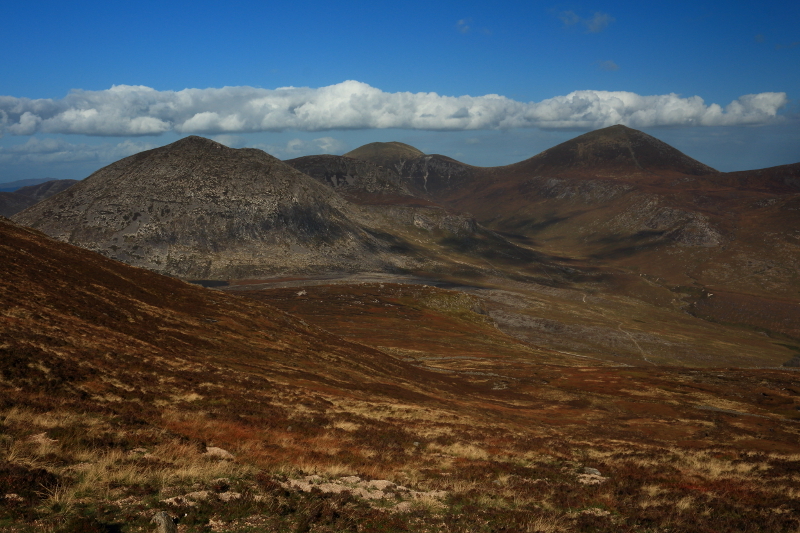 As I made my way around the slopes of Slieve Binnian East Top, the rocky tors on top of Slieve Binnian were visible too. 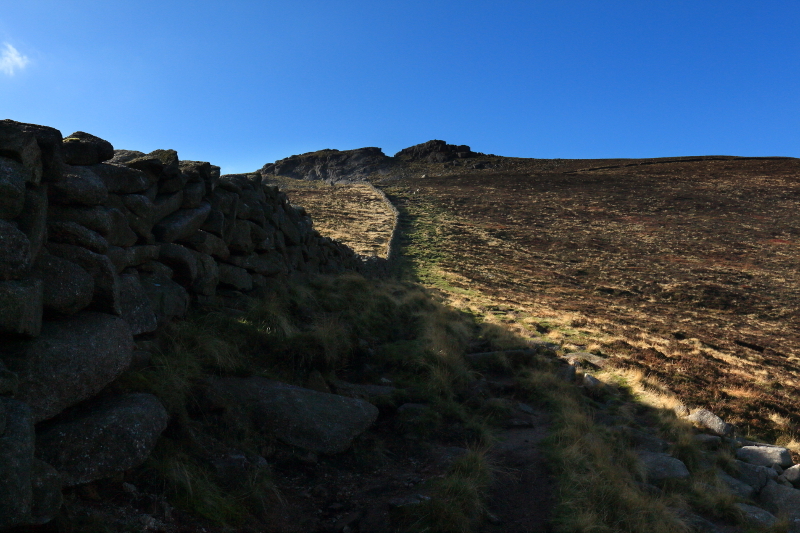 The Mourne Wall leading up to Slieve Binnian’s rocky tors. 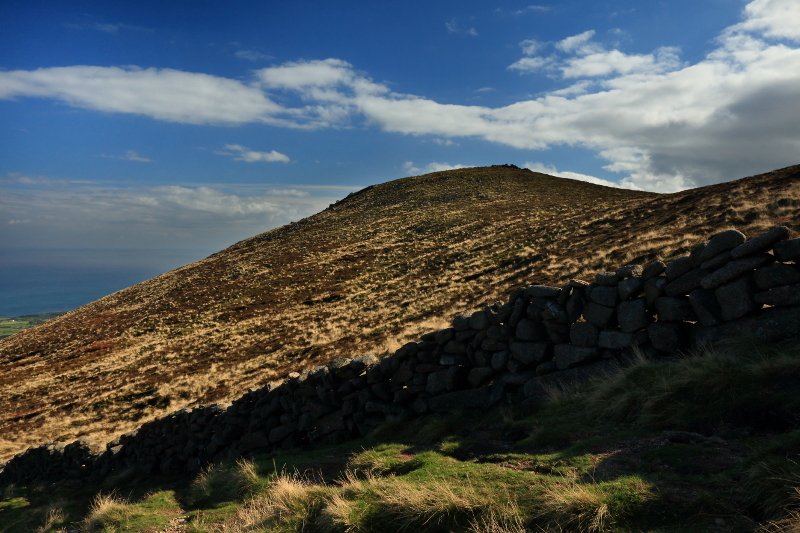 Binnian East Top from the west now. 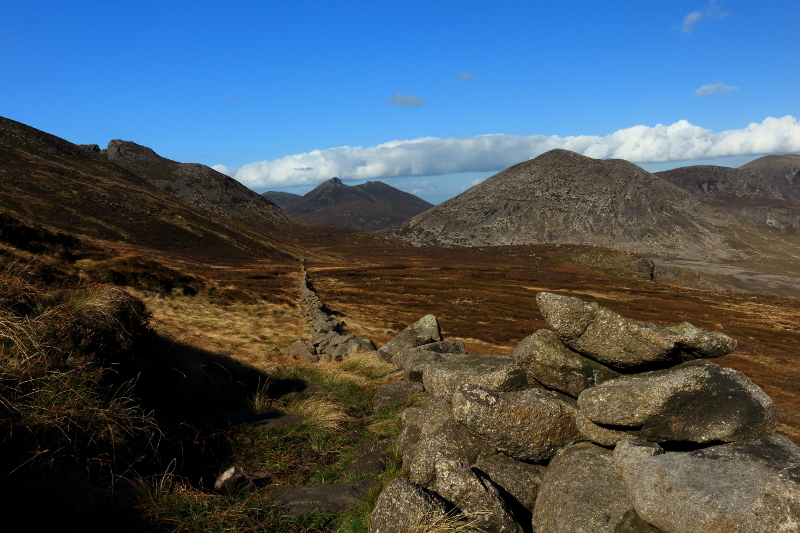 A look back down along the Mourne Wall which I had followed up. 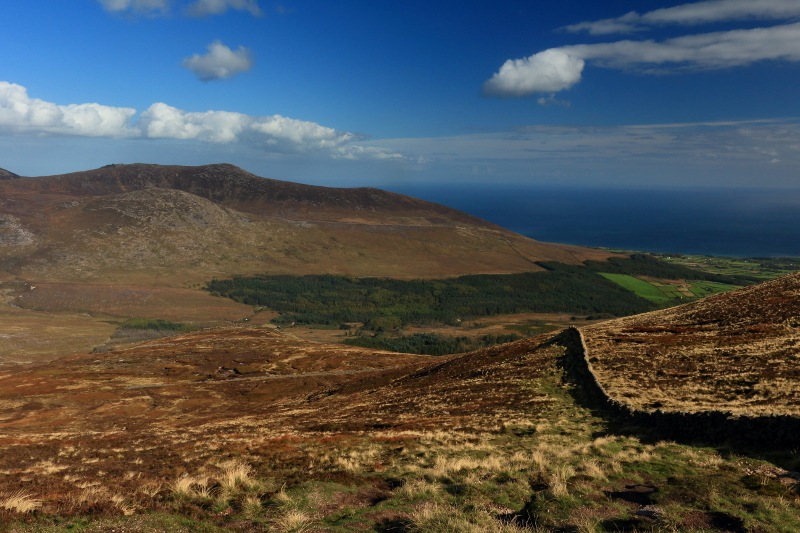 Slieve Donard, the highest mountain in the Mournes, Down and Ulster, standing tall. Looking back into the valley I had come up, with the sea beyond. 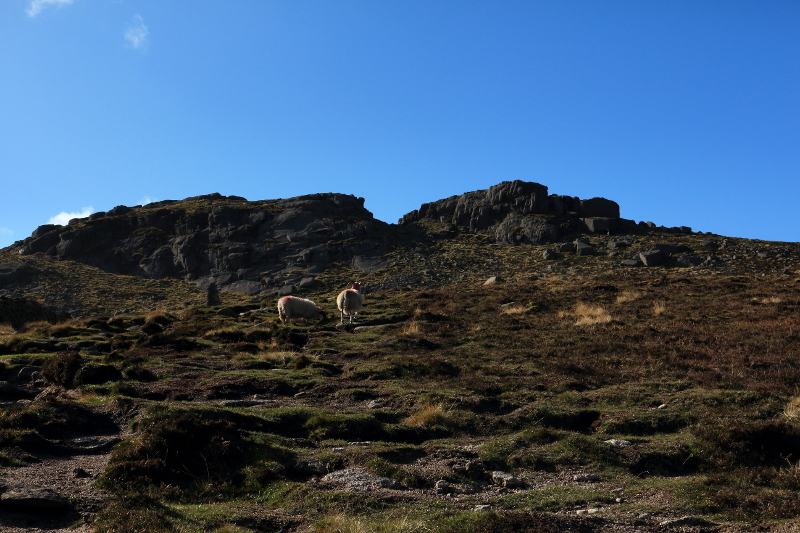 The last time I had walked up Binnian, there had only been a wall of grey in front of me, and the rocky tor had appeared suddenly, only when it was just a few metres ahead. This time I could clearly see it as I approached, and very striking it was. I made for a gap in the rock, which would allow me to get on top of the tor itself. 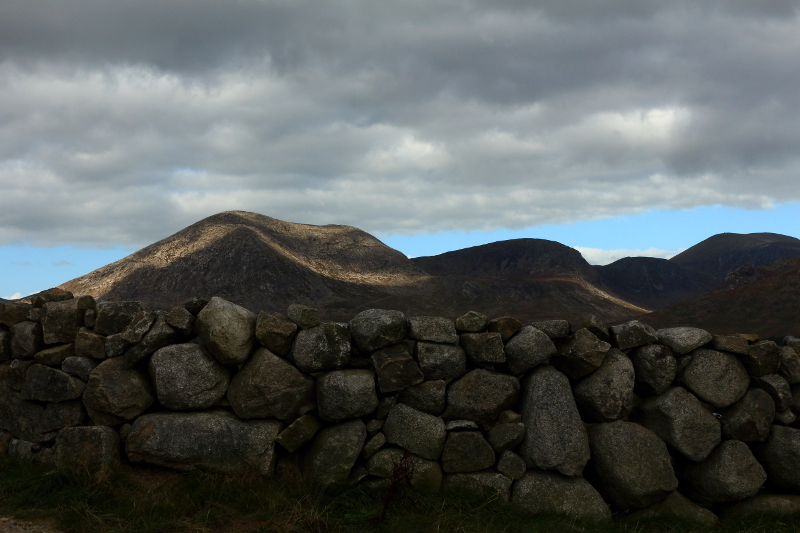 A rare break in the Mourne Wall as it reaches the sheer wall of the tor, just to the left of the gap I was making for. 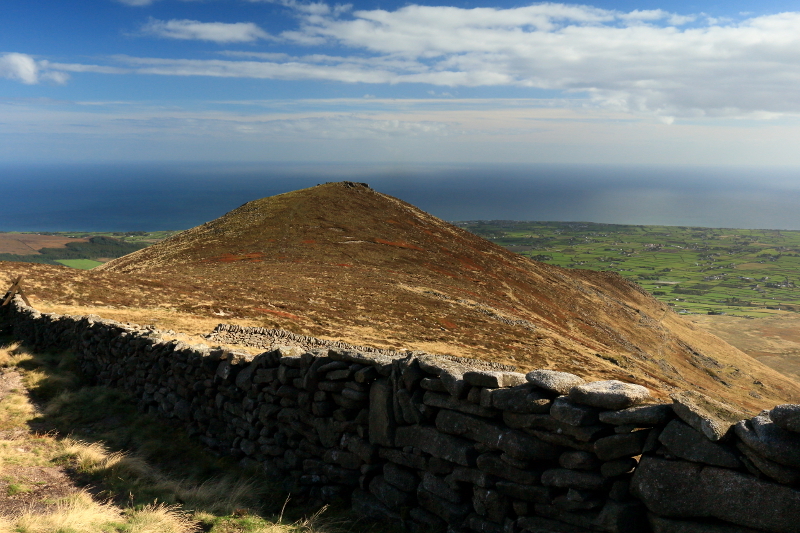 A view over the Mourne Wall to the “Kingdom Of Mourne” to the south, previously hidden by Binnian East Top. 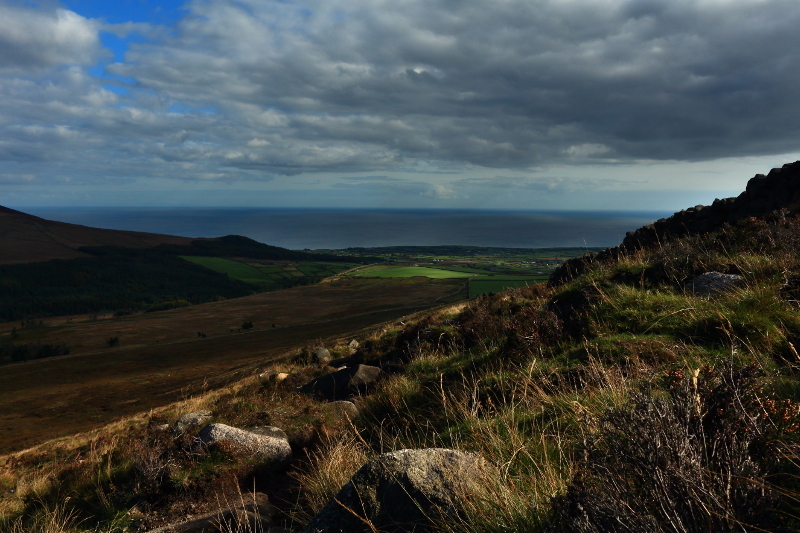 Close to the summit now, and high enough to be looking down from above on Slieve Binnian East Top behind me. As I reached the top, I was walking in bright sunshine, a complete contrast to my previous visit, and I knew I would be able to fully appreciate the top, and the views below this time. 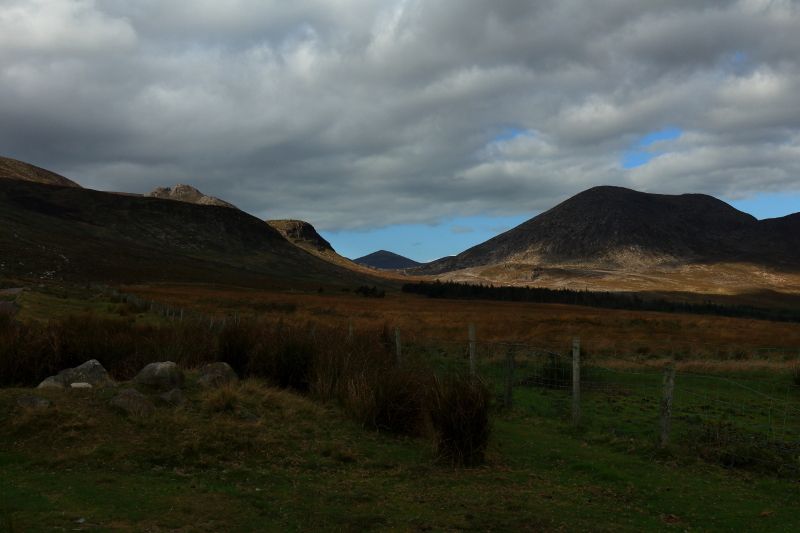 I’ll cover the exploration of the tors and the next part of the walk in Part 2. 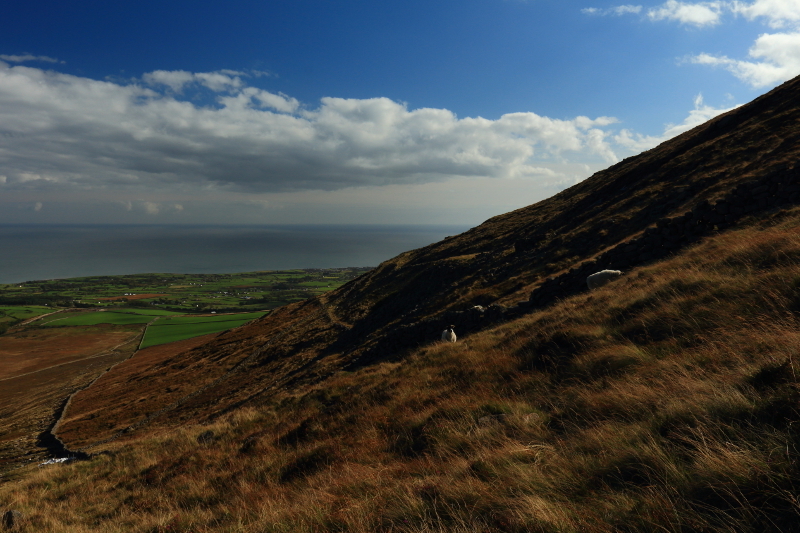 Posted in Landscape, Nature, PhotographyTagged Down, Ireland, Mountain, mountains, Mourne, Mournes, Slieve BinnianBookmark the permalink. Stunning views. Looks like it was well worth it to return to the location in better weather. I feel that I walked the walk with you but without the exhilaration you must have been experiencing to reach the summit on a sunny day. Thanks Jessica. The problem is now Jessica, when I was up there, I saw a lot of other mountains that I thought looked interesting! 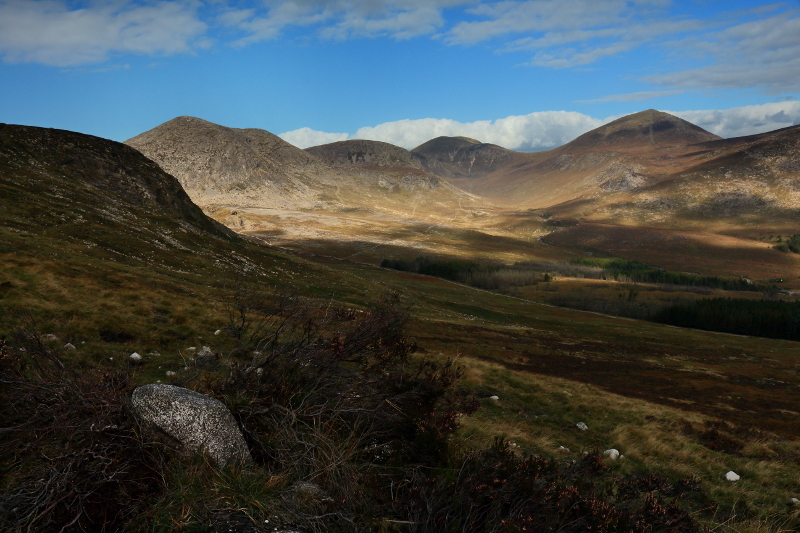 There’ll be a lot of trips to the Mournes I think. Should be some interesting rock formations in the rest of the series – I remember posting a link because of your interest in the tors in a previous post I think.